Albert Camus isn’t light vacation reading. He also penned the least likely passage to make it into Amsterdam’s tourism promotional materials. When I travel, I try to pack fiction about the place I’m visiting. But I’d forgotten to do my research before a planned long layover in Amsterdam that would give us a few hours’ wandering around the city, and the only novel that had come to mind that day in Kramerbooks was The Fall, about a narcissistic French expat who plays lawyer to criminals and outcasts in a post-war dive bar called the Mexico City and leads you, the reader, around the city telling him the secrets of his past. So there I was, sitting in coach, on a red-eye flight aboard a Flying Dutchman, nursing a tall, green can of Heineken, picking at a yellow curried chicken dish atop a photocopy of blue-and-white Delft china, hurtling, as it was, toward Hell at some unstoppable velocity. Schiphol Airport, at least the part I see, at least at two in the morning my time, is the Newark of Europe: a dimly-lit shopping mall of an airport with missing ceiling tiles and closed bathrooms, the exposed pipes of Brazil and the more than vaguely dystopian vibe of Alphaville. Was this the outer circle of hell? Even its name — Schiphol — is infernal, its second sound some unpronounceable guttural. Schiphol. I can only imagine its name was chosen to confound foreigners after long flights. The airport is only a short train ride from the city, as efficient as a train ride through Northern European suburbs should be. Not that we travel for efficiency. Romance, sure. Nostalgia, absolutely. Discovery, naturally. But efficiency? Rarely. But the train ride that morning was more than simple efficiency. It was a view of old photographs or an old film, the eerie juxtaposition of the damp gray of fresh snow against the silent men and women in long black coats against the quiet canals and the strict geometries of the post-war housing developments. “I like these people swarming on the sidewalks, wedged into a little space of houses and canals, hemmed in by fogs, cold lands, and the sea steaming like a wet wash,” says Camus’s unnamed tour guide. Ten minutes later we arrive at Centraal Station, which, for anyone shorter than six-foot-one, quickly becomes a lesson in inferiority. A good six inches shorter than the average Dutchman, I walk among them like a tourist seeing Manhattan for the first time. Outside the red and gold station, we skate along icy sidewalks that are never salted. We dodge streetcars and bicycles, so many bicycles, most headed toward a multilevel parking garage intended for bicycles. Apparently the city is so filled with bicycles it has run out of room for all of them and has plans to build a parking garage for 7,000 more of them on floating barges and in structure sunk beneath the harbor. But the cyclists are vicious and can’t be bothered to yield or even watch for pedestrians. I almost slip once or twice in the snow to dodge their paths. “I don’t know how they bike on the ice without falling,” I say. 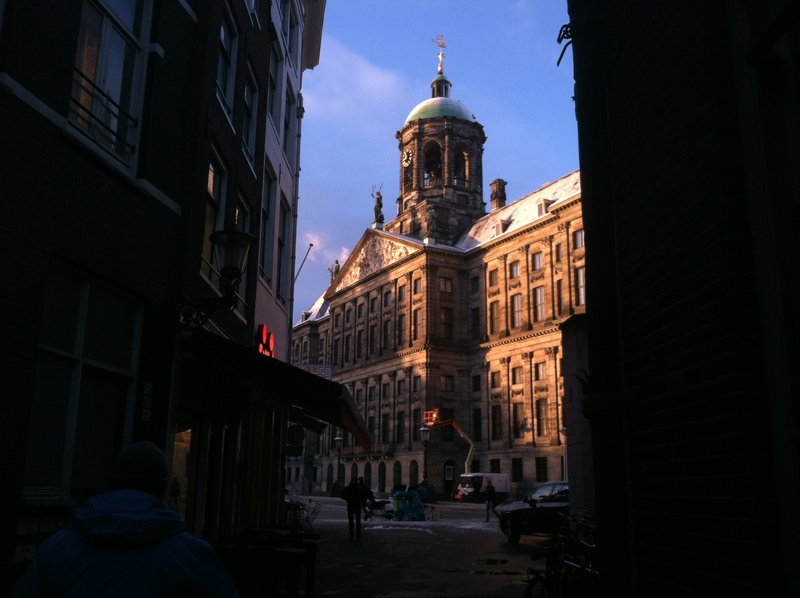 One of them rounds the bend of Dam Square, his bicycle slips out from under him, and he falls in the snow. Justice. We scamper away into the narrow lanes of tilted buildings. Gerrit Adriaensz. Berckheyde, The Bend in the Herengracht, 1671-1672. 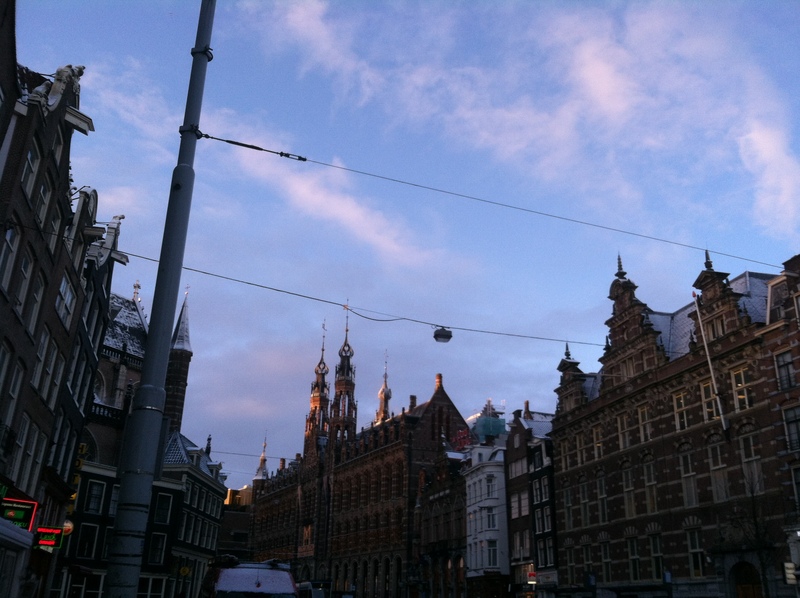 What strikes me most about Amsterdam is how painterly it is. New York and Paris feel like cities that, even painted to death as they are, remain still cities that are painted. 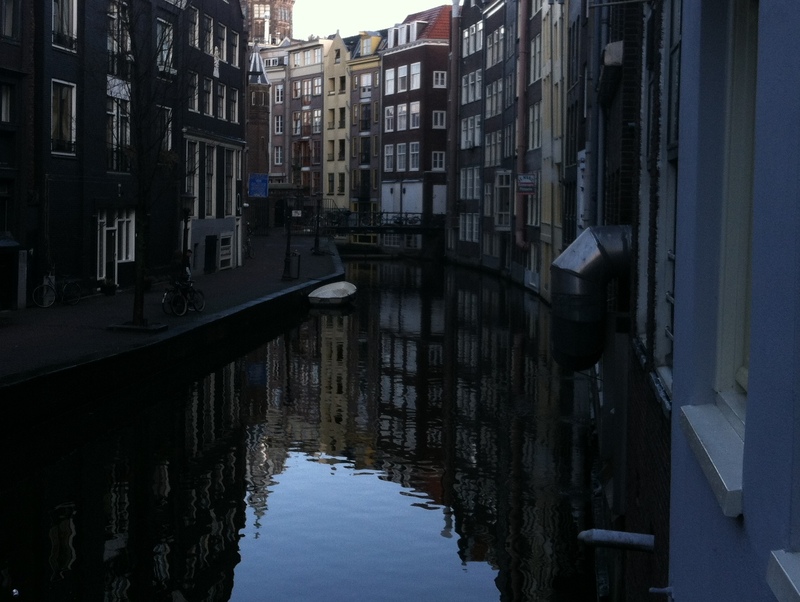 Amsterdam, on the other hand, is a painting that is merely inhabited. 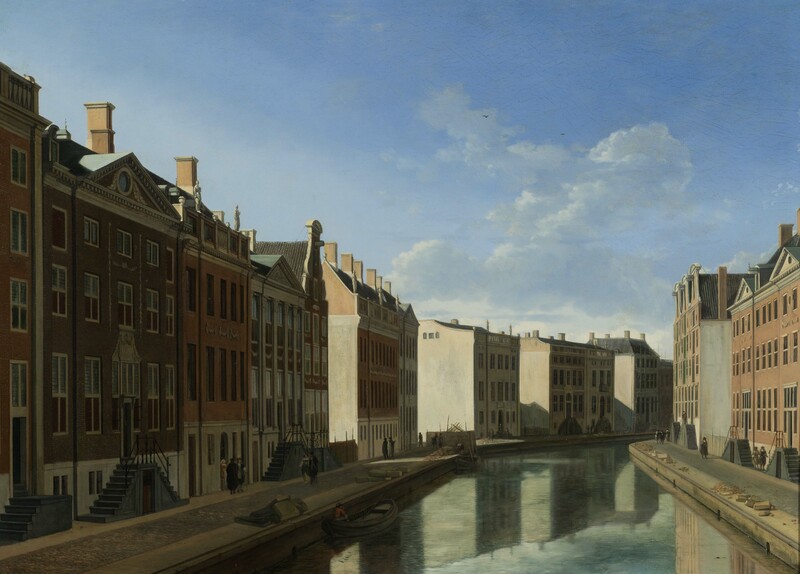 I’ve always loved the cityscapes of the Dutch Golden Age, especially the light and the shadows, the too-blue sky and too-perfect clouds, the architecture, and the canal reflections. One painting in particular, a portrait of the Herengracht by Gerrit Berckheyde, has stuck with me since I first saw it years ago at the National Gallery. Walking around the old part of Amsterdam, trees have grown up along the canals, bikes and cars now feel streets, coffee shops and souvenir stands line the alleys, but the city, that early morning in February, had the same light and shadows, the same too-blue sky and too-perfect clouds, the same architecture, and the same canal reflections. More than I’ve experienced in any other city — particularly early in the morning, particularly when the sky is that perfect blue and the clouds are just as you’d imagine them, probably after a few Heinekens and a long, sleepless, unnaturally-paced night of air travel — a walk through Amsterdam is a walk through art. 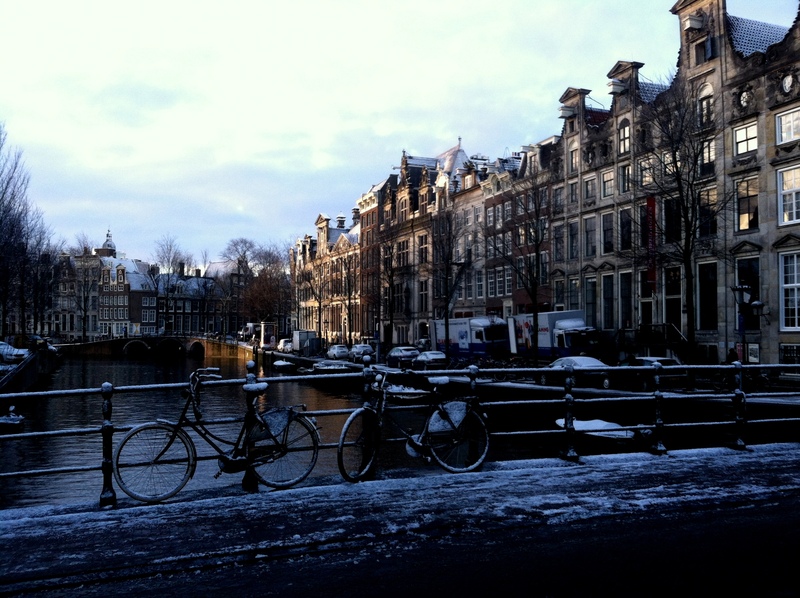 Last night’s snow has left the streets and bridges and abandoned bicycles beautifully white. 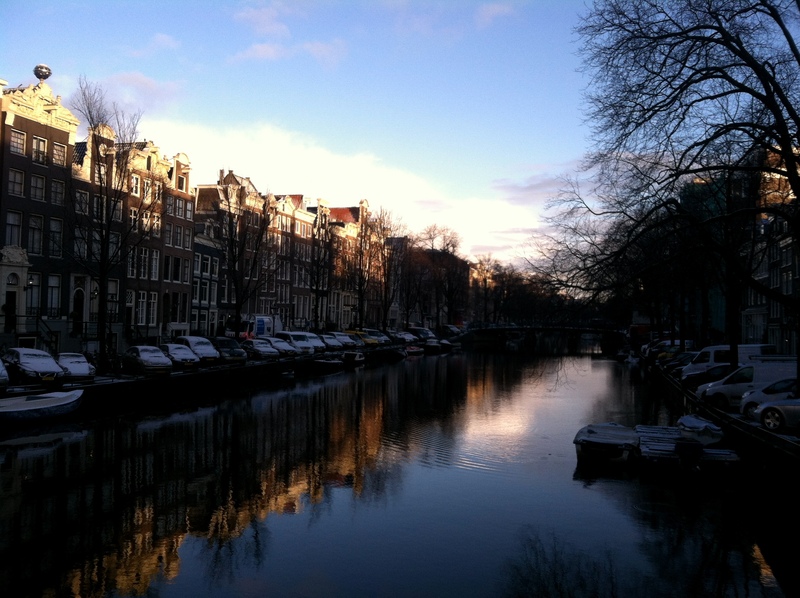 The canals are crisp and quiet, and the panes of the large, old windows glint like flashbulbs in the mid-winter light. But it is cold, very cold and icy, and we duck into what turns out to be a Chinese restaurant along a canal that advertises hot chocolate and the famous Dutch pancake, crêpe-like but thicker, doused in powdered sugar and syrup, and, in our case, framing four cross-sections of apple like a Greek cross. 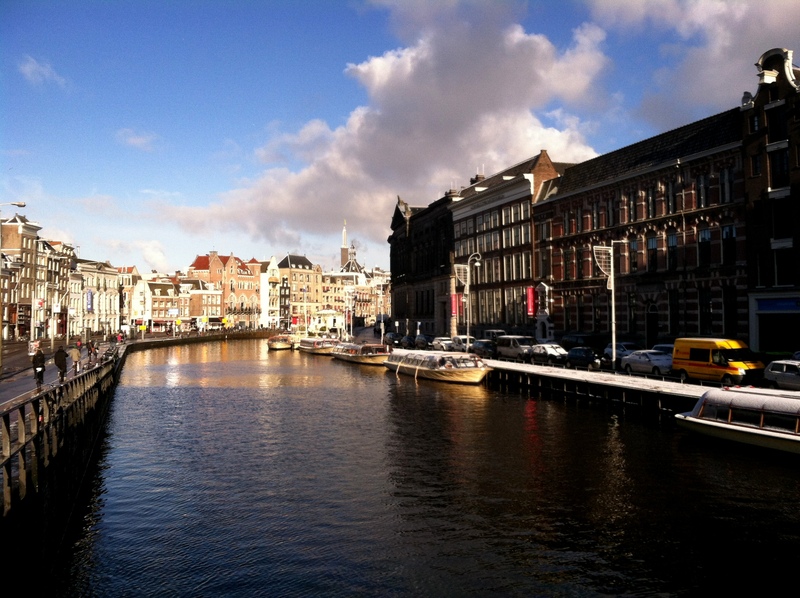 This is only a very short trip to Amsterdam — a few hours, really, between flights from Washington and to Zurich. Longer trips have their benefits: you have time to see what you want to see. But there’s some magic to a brief stay. Because you can never hope to see everything you want, you don’t even try to. You skip the museums and the monuments and forget the guidebook. Instead, you take the time to stare out at the snow, sit and talk for a while, wander without maps, linger over hot chocolate and apple pancakes without frustration because that’s all you have time for. I sometimes think shorter trips cultivate more saturated memories. I’ll remember the second-hand book market in the morning snow, the movers using the ladder-lift to move a refrigerator out of the second floor of a Renaissance house, admiring the deep blues and grays of the canal houses, feeling wonderfully lost, walking in circles, not because any of these are important, but because we were really there. Amsterdam is, of course, prostitution. The Red Light District is as essential to this city as Times Square is to New York or the Mall is to Washington, which is to say high on a visitor’s checklist and low on a local’s. 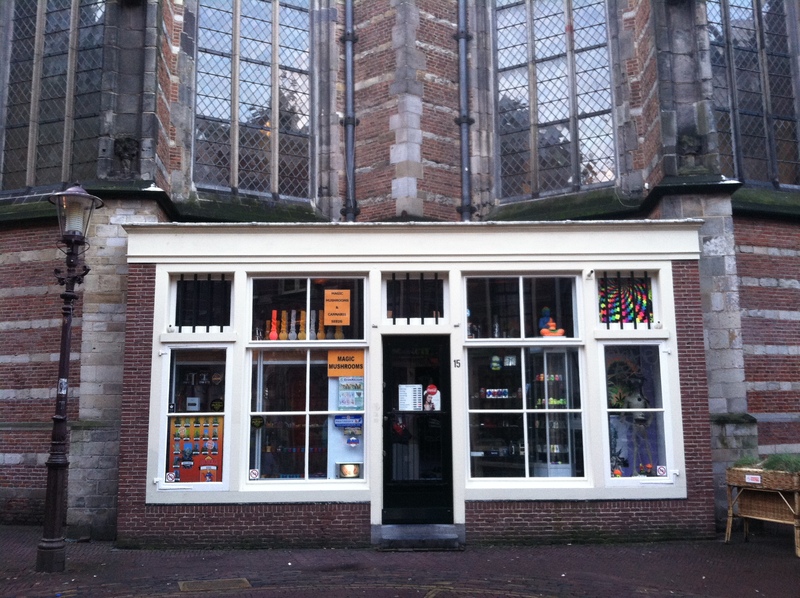 But the most interesting thing about the Red Light District, I think, are the glimpses of everyday life. She cuts her nails. She fixes her hair. She applies her lipstick. She talks on her phone. She looks concerned. She scratches her arm. She coughs. She yawns. If they catch you looking at them, they preen themselves, stand up tall, make Clara Bow faces straight out of silent films. They sell fantasies and “cheap dreams,” perhaps, but these are not mere shop window mannequins. Between the preening and posing, between the walls of their cubicles and the panes of glass, there is real life behind the windows, and it is fascinating. In the twenty-first century, the tulip market, arranged repetitively on identical barges along a canal in the city center, sells two things: beautiful, fragrant flowers and grow-it-yourself cannabis kits. At first, the juxtaposition along a side street of a magic mushroom shop in the walls of fifteenth-century church is as jarring as the chance meeting on a dissecting table of a sewing machine and an umbrella. But the scene gradually becomes less incongruous and more a sign of the heavy impasto of a complex city that floats along, as it long has, to the melding perfumes of tulips, flesh, and weed. It’s when you get hungry that you realize how much a city of the world this is. 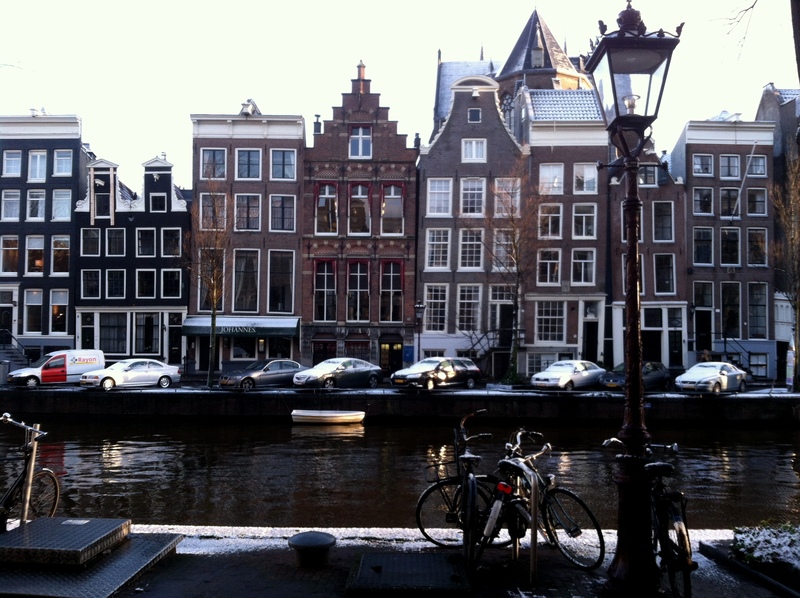 A port city and the capital of a once-powerful colonial empire, Amsterdam has always been cosmopolitan. The streets of its center are lined, for whatever reason, with more Argentine and Brazilian and Uruguayan steakhouses than I can count, a small Chinatown arranged incongruously among Renaissance houses (including one that advertises itself, in English, as “the place where the Chinese people eat,” but I’m quite sure that’s a lie), Surinamese buffets, and the Indonesian places the city is known for. We pass many Indonesian restaurants along the streets and canals., but as soon we decide we’re ready for it, we can’t find a single one. This sets off a long hunt across a cross-section of the canal neighborhoods, past dozens of coffee shops and head shops but no Indonesian restaurants, until, eventually, on a side street off the Damrak near the station, we find a small storefront wedged between competing French fry stands that serves both Chinese and Indonesian menus. Lunch was fine, but I’ve had better Indonesian in the Washington suburbs. This reminds me that, in an increasingly homogenous world, the best parts of travel often lie in the unexpected, not in the checklists you create for yourself. A few hours after landing, we’re back at Schiphol. I look over the pictures I’ve taken, at the tilted houses, the streets and canals they line, and the bizarre assemblage of people who run amok among them. Like cities in any part of the world, Northern European cities can begin to look and feel alike, with the same shops, the same restaurants, and similarly cosmopolitan people who dress the same, watch the same movies, and listen to the same music saved on their same phones. Amsterdam has elements of that, too, but this feels like a more unique place, with a scale, a color, and a way of living distinct from other cities. The look of the architecture, they way its buildings trip over each other and dangle over the canals, the blues and grays of its walls and skies, the way people live out their lives so differently and dramatically through panes of glass. I fall asleep over the pictures I’ve taken and wake up just in time to catch the flight to Zurich. very cool pictures ! and very classic style ! I would love to visit one day. Nice and interesting to read about my city through someone else’s eyes. I like the equation with a painting. Too blue sky, too perfect clouds; that’s what we call here the typical “Hollandse lucht”.